Notice: As logs are put into a queue, you can see monitoring logs be added even if you click the "Pause monitoring" button. Logs will continue to appear until the queue becomes empty. Export logs to file (html, xml, txt, cvs). According to the options, only selected logs and/or visible columns are exported. Full parameter content export can be queried too. - To hook already existing process(es), check "Attach to a running process(es)". - To hook a process at startup, select "Attach at application startup". Enter the application name and it's command line if necessary. If you want to spy only after a while, you can set a small amount of time in milliseconds specifying the elapsed time between application startup and begin of hook. If you want to start hooking application before statically linked dll TLS or DllMain execution, check the "Inject before statically linked dll execution". As soon as the application is hooked, it is suspended and the following message box appears. At this point you can load monitoring files and/or overriding dll while the application is still suspended. - To hook all starting processes, select "Attach to all new processes"
You can specify running processes to hook, or define filter rules for new starting processes. Do to this, click the "Filters" button. The processes filters dialog will allow you to configure all these options. Hooking this way, all defined monitoring files and overriding dll are loaded at the startup of new processes matching filters. To enable COM hooking, click the toolbar button on the main window before starting the application to hook. With default options you don't need to do anything else. To enable .Net hooking, click the toolbar button on the main window before starting the application to hook. Next you can attach application at startup or after launching it. As soon as process is hooked, interface changes a little, and a new space is displayed. Enter the path of a monitoring file (see monitoring file syntax) and next click the "Load" button. Once the file is successfully loaded it will appear in the list. You can load as many monitoring file you want and unload them independently in any order. To unload monitoring file(s) select them and click the "Unload" button. 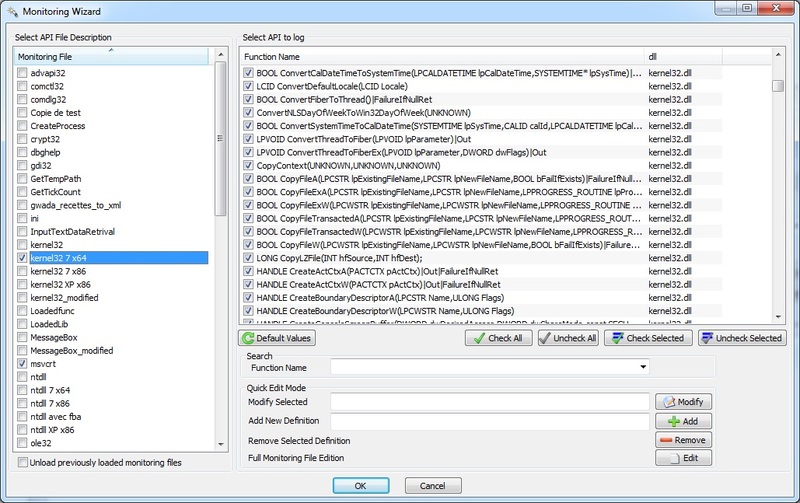 Check the wanted files to load and then click "Ok"
To change function selection in a monitoring file, first select the file (warning selecting is different of checking, click on the name of the file) and you will be able to search, select/unselect function and quick edit them. Enter the path of an overriding dll (see creating overriding dll) and next click the "Load" button. 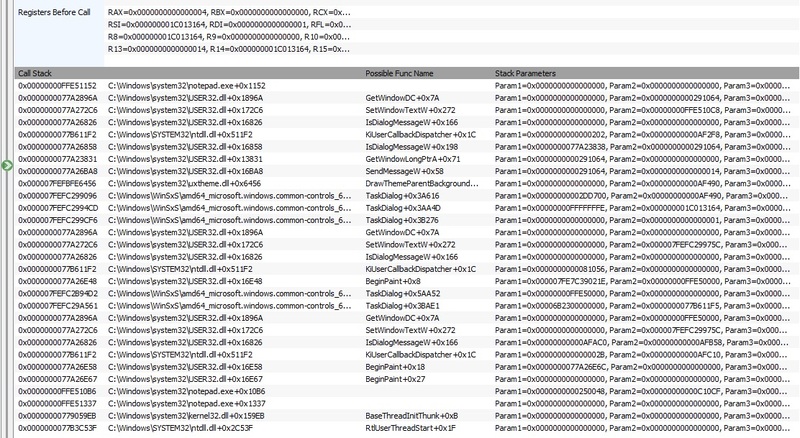 Once the dll is successfully loaded, it will appear in the list. 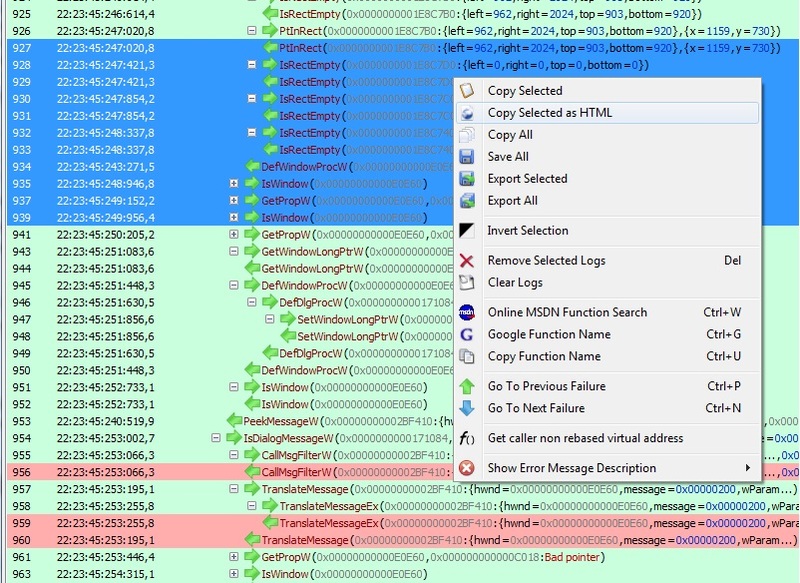 You can load as many overriding dll you want and unload them independently in any order. To unload overriding dll(s) select them and click the "Unload" button. To avoid a big list of useless logs coming from system dlls (like kernel32.dll, user32.dll...), you can put filters to discard modules from being logged. For more information see the Modules Filters documentation. - The module name : the name of dll containing the hooked API. This field is usefull if functions of different dll have the same name. Calls with a red background are the failing ones. - Get non rebased virtual address: If dll has been rebased, this function compute the caller address, as if dll was not rebased. As the string representation of the calls is limited in the main view, there's another view called the detailed view at the right of the main view. Each time you select a log in the main view, the detail view is updated. Default supported types, user types and user defines are fully expended and displayed. Due to Microsoft ListView control limitation, data representation using more than 260 characters are not fully displayed. To display the full data content do a right click on it and use the "Show Hex Data" menu (or simply double click on it). The "Copy"and "Save" menu will copy and save the full content not only the 260 characters. Since version 6.0, WinApiOverride can use Microsoft pdb server to display better function information for microsoft dll. As first element is the returned address of current monitored function, all information (function name and parameters) are already displayed upper. For next elements, you get two rows : one called "Possible Func Name" and another "Parameters". In the "Possible Func Name" one, you will find, only for dll, the name of the exported function whose address is the nearset lower address of the calling address. As you can see on the screenshot it can fail (as soon you get two or more time the same name it is suspicious). the display name will be the ExportedFunction1 name; although the real calling function can be ExportedFunction1, NotExportedFunction1 or NotExportedFunction2. In the "Parameters" row, you will find raw parameter value. An advanced parsing on parameters can't be done as we don't know function name and type. So you will get only stack values. 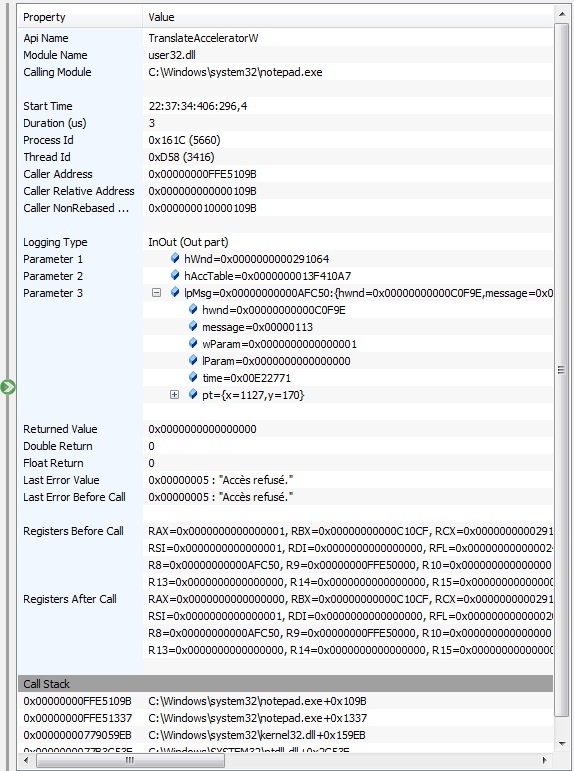 Since version 5.0 "Try to retrieve call stack" option is no more requiered to do a call tree. Since version 6.5.1 live call tree is available : tree is built during monitoring. 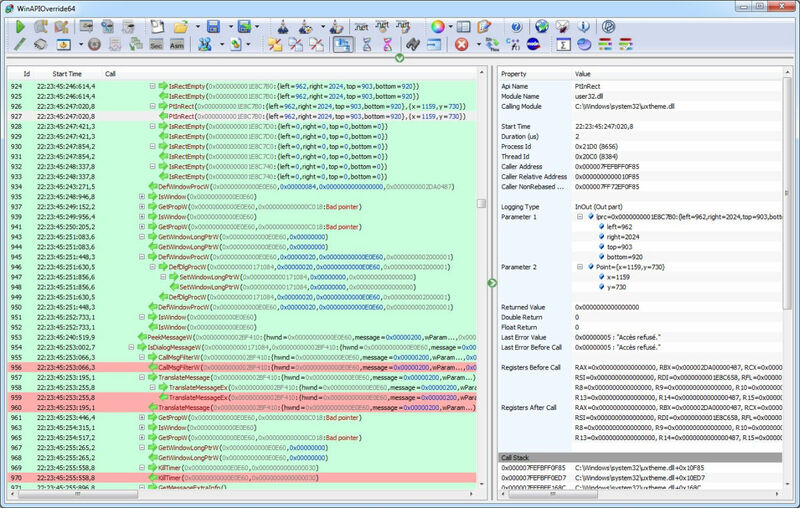 WinAPIOverride will display call depth of function and subfunctions. To go out of the Call Tree view, just click the "Time View / Call Tree View" button again. Command line has multiple advantages. or with the NoGUI option, you can change an application shortcut to override an API, without visible changes, each time this application is launched. When you run a 32-bit graphical user interface (GUI) application, cmd does not wait for the application to quit before returning to the command prompt. AppPid=ProcessId : hook the specified process(es). ProcessId can be in decimal or hexadecimal. To hook multiple processes, split process id by ';' ex: "AppPid=3392;0x1567;2758"
All : to hook all processes matching AllProcessesInclusion, AllProcessesExclusion and AllProcessesParentPID filters. All processes defined in AllProcessesPID are hooked just after WinApiOverride start. AllProcessesParentPID=Number;Number-Number;Number : Process parent Id filters (See Processes filters ) Optional, available only for All option. AllProcessesPID=Number;Number-Number;Number : Current running processes to hook (See Processes filters ) Optional, available only for All option. you have to manually kill WinApiOverride using task manager, and so no logs saving can be done. WinAPIOverride32.exe AppPath="c:\windows\notepad.exe" MonitoringFiles="D:\WinAPIOverride\monitoring files\InputTextDataRetrival.txt";"D:\WinAPIOverride\monitoring files\MessageBox.txt"
WinAPIOverride32.exe AppPath="c:\windows\notepad.exe" InjectOnlyAfter=200 AppCmdLine="foo.txt" OverridingDlls="D:\WinAPIOverride\FakeMessageBox.dll"
WinAPIOverride32.exe AppPid=2024 MonitoringFiles="D:\WinAPIOverride\monitoring files\InputTextDataRetrival.txt" ExclusionList="NotHookedModuleList.txt"
WinAPIOverride32.exe All OnlyBaseModule AllProcessesInclusion="not*";"calc*" AllProcessesExclusion="*.com";"*.pif" AllProcessesParentPID=2032;3056 AllProcessesPID=2027;2045-2050;3012 MonitoringFiles="D:\WinAPIOverride\monitoring files\InputTextDataRetrival.txt" OverridingDlls="D:\WinAPIOverride\FakeMessageBox.dll"